I thought it would be fun to do a review on one of my all-time favourite movies, one that's a classic yet filled with so many gorgeous fashion gems. 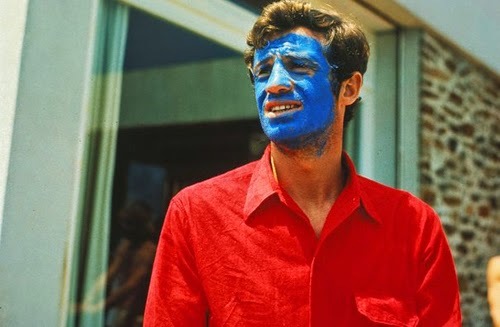 Jean-Luc Godard's Pierrot le Fou is a 60s delight and is such a piece of cinematic artistry from so many different perspectives, be it from cinematography to dialogue. The movie centers around Ferdinand (also called Pierrot), who becomes bored of his routine, high-society life. He decides to run away with a former love interest Marianne, who he finds out is entangled with mobsters from Algeria. The two run away together, searching for adventure as Pierrot finally discovers how to feel alive. Anna Karina is absolutely adorable and basically my style icon. First off, let's take a peek at Marianne. The free spirited protagonist has a really feminine and pastel colour palette the first time we see her. A baby blue robe she wears at home and then a pale pink dress with a pale blue cardigan. These pieces attract an almost childlike innocence to her and could explain why Pierrot decides to run away with her. The pale pink dress has a frilly trim at the top and bottom and suggests a delicate quality about her, which she later on sheds for a different persona. As the movie goes on, Marianne starts opting for more fiery red tones, slowly getting rid of her delicate persona for a more adventurous one. She wears a red and white striped dress with a white bow in her hair at one point, the feisty red peeking through the white innocent details. One of the final outfit changes consists of a red dress with a u-neck collar and small white trim on the sleeves. This is Marianne at her most passionate and feminine. She even says she doesn't care about money or buying records or clothes, all she wants to do is live and this piece proves it. Pierrot on the other hand goes through a completely different experience through his clothing choices. His palette becomes less boring and free spirited, as well as gaining some delicate hues which show emotion. Starting off with a tweed grey suite, Pierrot is living a dull life and you can definitely tell. Although always fashionable, he isn't exploring colour just yet. Upon running away and breaking out of his shell, Pierrot has on a colourful striped button up with shades of red, blue, purple, green, and yellow. He's loosing up and his emotions are running wild after being confined for so long. He moves on to a pale blue suite after a while, subsiding his emotions and becoming content with what his life is becoming. Near the end (and I promise I won't ruin it), he finishes the movie with a bang and wears a bright red shirt; Godard's way of telling us the passionate state he's in. Still a babe even with blue face paint. 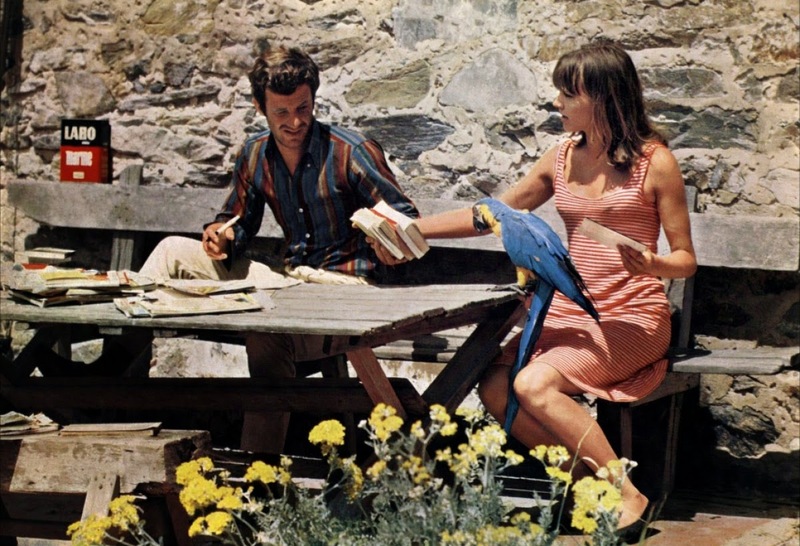 As for Godard's use of primary colours in the movie? It's definitely visually pleasing to see so many variations of red and blue contrasting, but there must be more to it! If you think about it (and this is just my interpretation, mind you), The red and blue represent opposites in the movie. Red is there for the emotion and and desire in the film, all of the fiery emotions a human can feel. Red in this case can also display femininity, like in Marianne for example. Blue on the other hand can convey masculinity, order, peace, and structure. These two colours are in constant contrast with one another, and it's no wonder this is why our two leads are stuck in a constant struggle to communicate properly. Welcome to life between men and women. All in all words cannot express how much I recommend this movie. It was so much fun to review as Godard really is a genius, and nothing is left to chance when it comes to his directorial style. If you guys want a peek at some modern day inspiration that came from this movie, take a peek at what I assembled below! Interesting idea about costume review in some movie.. I like striped red dress ( for summer) and specially red dress and white stripes. Loving these outfits and great inspiration! I have never seen this movie but would love to now! Love the pairings in that last outfit! That dress is amazing! Very cool post!! Love your blog :) Just stumbled upon it today!! Sounds like a good movie and I like the girl's style in it! Have a nice day, Marta! I always adore reading your movie and costume reviews....your psychological reading and interpretation of clothes (patterns/ colours) is always so right on! I must see this film, it sounds great! Nice post, love the outfit! The outfit you put together from the movie is so adorable!